Each year, the Patricelli Center for Social Entrepreneurship awards three $5,000 seed grants to fund the launch or early-stage growth of a project, program, or venture. Cardinal Kids, run by George Perez ’20, Katie Murray ’19, Jenny Chelmow ’19 and Mariel Middlebrook ’20, was one of this year’s winners. This is their final report since receiving funding from the PCSE in March 2018. You can read their other reports here and here. Musical Mentor Henry Hodder ‘20 working with two of his guitar students. During the fall semester of this academic year we rolled out our musical mentoring program at Oddfellows Playhouse, and secured a vital partnership with the RJ Julia bookstore, to offer weekly classes for local youths in the coming semester. Mariel Middlebrook ‘20, coordinated our partnership with Oddfellows for musical mentoring. 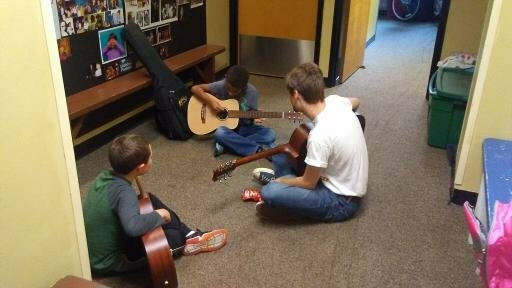 This semester the musical mentoring program has expanded to include two different age groups. Monday classes focus on children ages 8-11 and Wednesday classes are designated for children ages 5-7. In addition to offering lessons in guitar and keyboard, we have expanded to include voice, violin and cello. 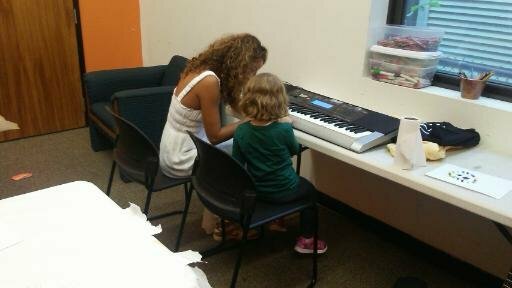 The musical mentoring students have worked individually with a Wesleyan mentor, with the exception of three small group lessons. The mentors tailor their lesson plans according to their students’ individual needs, and collaboratively work towards preparing a final presentation for the end of term Oddfellow’s concert. We received a major setback this semester when it was determined that bringing children to campus without parental supervision created a conflict with the Wesleyan’s insurance policy. This caused us to rethink our model with the help of our partners at the Office of Community Service and the Patricelli Center. While we originally imagined a more centralized youth program that would take place on Wesleyan’s campus we are increasingly becoming a decentralized program that works throughout the community. As we continue to grow, we hope to build our presence in various community centers, which will allow us to both engage different parts of the community and offer a wider range of teaching opportunities for Wesleyan students. Beginning in February of 2019, we will run Cardinal Kids programming at RJ Julia Bookstore. We are recruiting Wesleyan students who may not have teaching experience but are interested in teaching a class on a subject they are passionate about. Subject matter will be broad and diverse, from origami to hip hop dance. TAs and coordinators will be present at each session to aid teachers with their lessons and to provide children with individual assistance. Interest in Cardinal Kids has been overwhelming; we are currently working on syllabi with ten potential teachers and we hope to have a tentative class schedule by the new year. Each class will run from 4:30-6:00 pm on Tuesdays and Thursdays. Classes will be free and open to all, but lessons will be targeted at children in grades 1-5. We will be paying all of our teachers for the hour and a half that they work. Because we are not charging for admission, the money to pay our teachers will come solely from our grant fund. We have enough money to get us through this spring semester, but if we want to continue running programming in the fall, then we will need more funding. We are in the midst of preparing an application for the innovation fund where we believe we will be competitive. Our progress thus far would not have been possible without the help of the Office of Community Service, our first partner. They have helped us work through multiple iterations of our model and the help of the Coordinator of Community Participation, Rhea Drozdenko, has been invaluable. We would again like the thank the PCSE selection committee for selecting Cardinal Kids to receive a seed grant last spring. We continue to expand our programming with the funding provided by the PCSE seed grant.